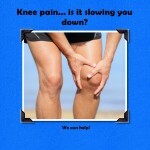 Knee Pain... is it slowing you down? Knee pain… is it slowing you down? There are two types of knee pain temporary, which would be a recent accident or injury, or chronic knee pain which is often a culmination of different factors or old untreated injuries. Who is at risk for chronic knee pain? How can chronic knee pain be reduced or prevented? Warm up before exercise. Stretch your quadriceps and hamstrings before and after exercise. Try low-impact exercises. Instead of tennis or running, give swimming or biking a chance. Mix low-impact exercises with high-impact exercises to give your knees a break. Walk down hills. Running puts extra force on your knee. Instead of running down an incline, walk. Stick to paved surfaces. Rough roads or pocked walkways may be hazardous to your knee’s health. Stick to smooth, paved surfaces like a track or walking arena. Get support. Shoe inserts can help treat foot or gait problems that may be contributing to knee pain. Replace your running shoes frequently to ensure they still have proper support and cushioning. Our knee is a complex joint and is susceptible to a number of injuries and conditions. If you experience knee pain, new or old, book a first assessment with Zoya Imran our Physical therapist today and receive a selection of Physical therapy and if she recommends chiropractic, message, and or acupuncture treatments. A doctor’s referral is not required. She will get to the bottom of your condition and let you know what it’s going to take to fix it. Call our office today.